MB: This is also great black music which is speaking about what's real. In Coldcut we've tried to keep the idea that music should be 'about' something at the fore. It's pretty easy making abstract music and a lot harder to make something which has a direct meaning. Fela Kuti had no problem with that, because he was living in a country that was dangerous and demanding. Artists have nothing to work with but your experience. My experience has been quite comfortable really so in a way, that's a limitation. I admire Fela Kuti because he lived large and he lived dangerously, not perhaps through his choosing, but because of the country he was born into and the life that he had. He took that, and made an art-form out of it. He made his character out of it. It spoke to different people around the world, including me and my mates at Oxford. We used to get into those records to a deep extent – and what is the story to Coffin For The Head Of State? The story is that Fela spoke out against the very corrupt Nigerian government, and from time to time they would turn on him. At one point, they raided his community, beat up and raped and damaged to their heart's content and threw his mother out of a window – she died. 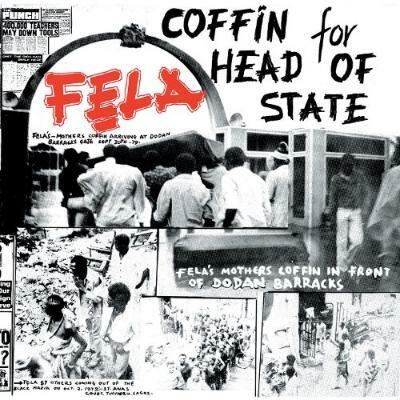 She was also an activist, and so Fela took her body and put it in a coffin and presented it to the head of the Nigerian state. That is something that is a lot more real than you'd find in most music and even now just talking to you about it chokes me up. I cannot imagine what that must have been like – to lose your mother to the fascist, corrupt forces. There's a lot of negativity and dark forces in the world right now and I aspire to be part of some sort of resistance. Records like this formed that stance for me. This record might be seen as being a particularly personal record, more so some of his others. But they're often political in a personal way. MB: Yes, as they say the political is the personal. Anything else would be a statement of pure stupidity, because politics is the air you breathe. It's the bus that doesn't come, it's the hospital appointment that you don't get so your dad dies of cancer. It's everything.